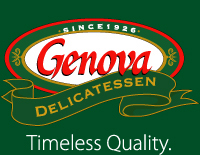 Located on 51st and Telegraph in Oakland’s Temescal District you will find Genova Deli. It is the best sandwich shop around(unless you’re near Old Oakland’s Ratto’s Deli). For the Temescal District though, this is the place to go. A nice fast paced quick fire efficient deli with the old ticket numbering system. You pick a number, wait your turn and state your needs. The deli has more than just sandwiches though. All sorts of things from raviolis, olives, pastas, cheeses and more. So if you’re in this area then this is the place to go for a yummy healthy lunch. But beware, parking can be so frustrating, the line can take a while and finding a place to sit can even be a hassle. It’s more for a pick up and go type place.